Kevin is an unpleasant man who loses his job. He finds it difficult to deal with other people. He has those he considers friends, and he theoretically spends time with them, but he mostly prefers to focus on code, alcohol, and good old-fashioned cynicism. Kevin begins having odd hallucinations. One minute he is finding comfort with a complete stranger, and the next he is in a darkened, pixelated wood. A crowd of things are gathering, yet Kevin doesn’t sense danger from the creatures, just anticipation. Something is about to happen. Before Kevin can get to the bottom of the gathering, he is thrust back into his normal life. The visions, however, do not stop. Soon the dream figures are following him into reality. Life conspires to keep him in the small town of Deptford, longing for his first love and feeling numb inside. He isn’t exactly happy with his existence, but he doesn’t have much motivation to change anything. Things do begin to change, however, in strange and horrifying ways. Author Jeffrey Koval Jr. spins a story of cynicism, introspection, and addiction. As Kevin must overcome the trials and tribulations of everyday life, he will become more and more entranced by his hallucinations. Is he crazy? Prophetic? Or something else entirely? 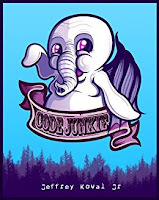 Code Junkie is a tale about an unpleasant man who loses his job. Code Junkie is available in two different paperback formats and as an ebook on the Amazon Marketplace. The Unbound edition features larger print, a looser flow of formatting, and a few more creative liberties taken in the physical manifestation of the book. Ideal for warding off enemies as a blunt object or for use as a doorstop. The Pulp edition is a sleeker, more minimalistic take on publishing and comes in a slightly smaller package. Recommended print version for slipping through customs or using for scrapwork in sordid affairs or dealings.